Years and years ago when my husband first suggested that we make crab legs at home I was terrified. I really had no idea how to cook them. I imagined a horrible disaster where we would end up making a frozen pizza to eat. 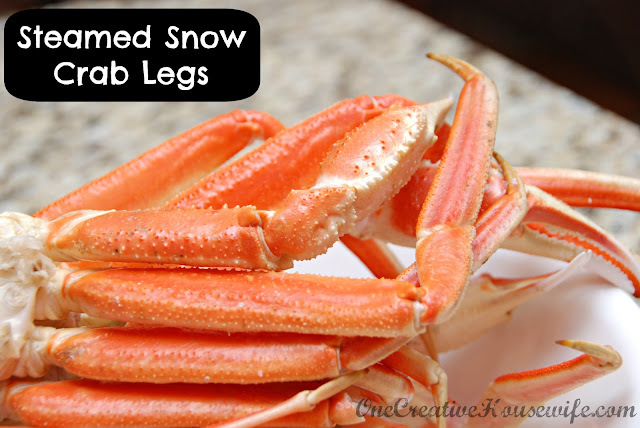 Thankfully cooking crab legs is extremely easy, and they have since become a favorite in our household. 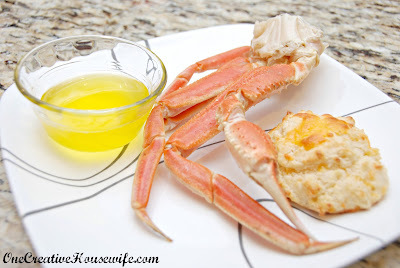 There are several different ways to cook crab legs, but I like the naturally sweet flavor that the crab legs get from steaming them. 1. In a large stock pot (preferably with a strainer insert) bring water to a boil. 2. Rinse ice from crab legs and place in strainer insert. 3. Place strainer in pot and cover. 4. Steam the crab legs for about 7 minutes, until the legs are heated through. If you don't have a pot with a strainer insert, you can use less water and place the crab legs directly into the boiling water. Crab legs are absolutely delicious with clarified butter.